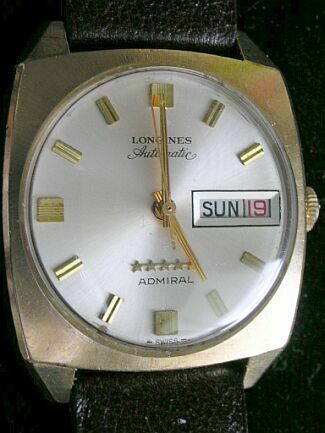 LONGINES Admiral Five Star calibre 507 with day and date feature. Case by Longines-Wittnauer Star Watch Case Co. Case #2946-507 10 Karat Yellow Gold Filled. Movement # 50340XXX. The movement is in mint condition. 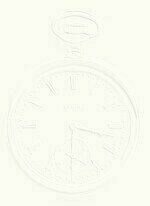 The date is advanced by pushing the crown in and the day is advanced through the normal setting mechanism. The white dial is also in original excellent condition. The gold hands match the gold numerals. Sweep second hand, signed crown. The case shows almost no wear except for the end of the lug nearest the "7" marker. 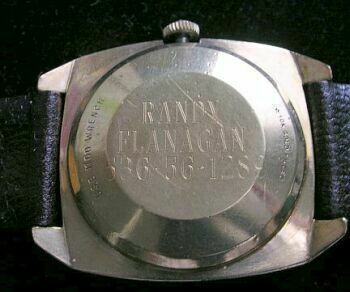 The back is engraved with a name and numbers, otherwise the case would be in mint condition. Case is approx. 31mm, 18mm between lugs. White alloy "lifetime" mainspring. New crystal and new leather band. The self-winding mechanism has a good storage capacity for the motions of the watch winding the mainspring for off the arm running (at night). This is a very nice watch!